I had no idea what to expect when I strolled into the Cookeville Senior Citizens Center a couple of months ago to play table tennis. The first thing I learned was that I needed to become a member of the center to participate in its programs. The process is simple—just a few pages of paperwork—and free. I made my way to the big multi-purpose room to discover a ping-pong table set up in the corner and surrounded by moveable fence panels. Three men were volleying an orange ball back and forth over the net. “You here to play?” one of them asked. I nodded. Another wanted to know if I had a paddle. When I confessed I didn’t own one, they directed me to a storage room where extras were kept. These were the ping-pong paddles I was accustomed to—inexpensive thin blades covered with a single sheet of pebbled rubber. I picked one out and headed to the table, where my new friends introduced themselves and invited me to hit with them. It didn’t take but a minute or two for me to realize I was out of my league. These guys would hit me the ball and I’d miss it entirely. What the heck was going on? It had been a while since I’d played, but not long enough that I had completely lost all eye-hand coordination. That morning, I added two new items to the list of life skills I hope to master. 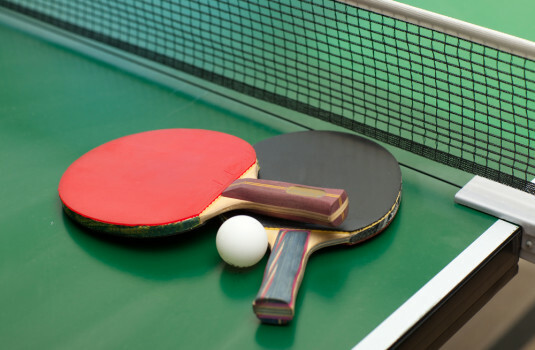 Number One: learn to recognize and return a table tennis ball that comes at me with topspin, bottom spin or side spin. Number Two: use those spins on offense. I’m not anywhere close to achieving either of those goals yet, but I’m getting better. And much to my relief, I’ve learned I’m not the only garage ping-pong player who hangs out at the senior center. We’re a mixed bag of ages, skill levels and athletic ambition. Those who know a lot—Larry, Paul, Gary, Ernie and Jane, I’m talking about YOU–are patient and generous with those of us who don’t. We’re all there with two big goals in common—friendship and fun. Interested? If you’re age fifty or older, come join us on Tuesday and Thursday mornings at 9:00. You don’t need to know a thing about ball spin to have a great time.